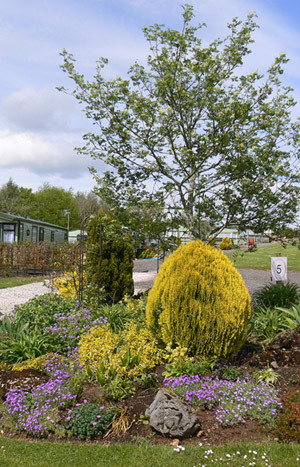 Woodside Caravan Park is a small peaceful park set just on the edge of the village of Greystoke. The park is reserved exclusively for privately owned static caravans (environmental green colour) and offers 37 fully-serviced pitches. Dogs are allowed subject to owner’s consent. We are easy to find with nearby motorway access – M6 (junction 40). Click HERE for a Google Map showing our exact location. The caravan park is attractively laid out with large areas of grass and trees. there is an abundance of wildlife as we feed the birds and squirrels all year. Here you can come to relax and let the world go by! A five minute walk away from the caravan park is the centre of Greystoke village where you will find an outdoor heated swimming pool, children’s playground, public house offering a good menu and a shop with post office.Wi-fi and Broadband are available at an extra cost. There are many places of interest within easy reach of the site including many of the Lakeland Fells, the tranquil shores of Ullswater, the towns of Keswick and Penrith, the historic city of Carlisle plus golf courses, potteries, art galleries, antiques shops and much more. Click HERE to see photos of some of these beautiful and fascinating local attractions.